Where the McLarty Ranges meet the ocean, The Horizontal Falls (or Garaanngaddim in the language of the Dambimangari people) are regarded as one of the Kimberley’s most well-known natural treasures. The Kimberley region boasts some 350,000 overnight visitors per annum, drawn to its pristine coastline and dramatic natural landscapes. The Horizontal Falls -- affectionately nicknamed ‘the Horries’ -- are situated within the Buccaneer Archipelago and have been regarded by Sir David Attenborough, amongst others, as “one of the greatest wonders of the natural world”. The site’s unspoilt terrestrial and aquatic ecosystems are due, in most part, to its remoteness, and add to the impressive aura of the pre-Cambrian sandstone range. 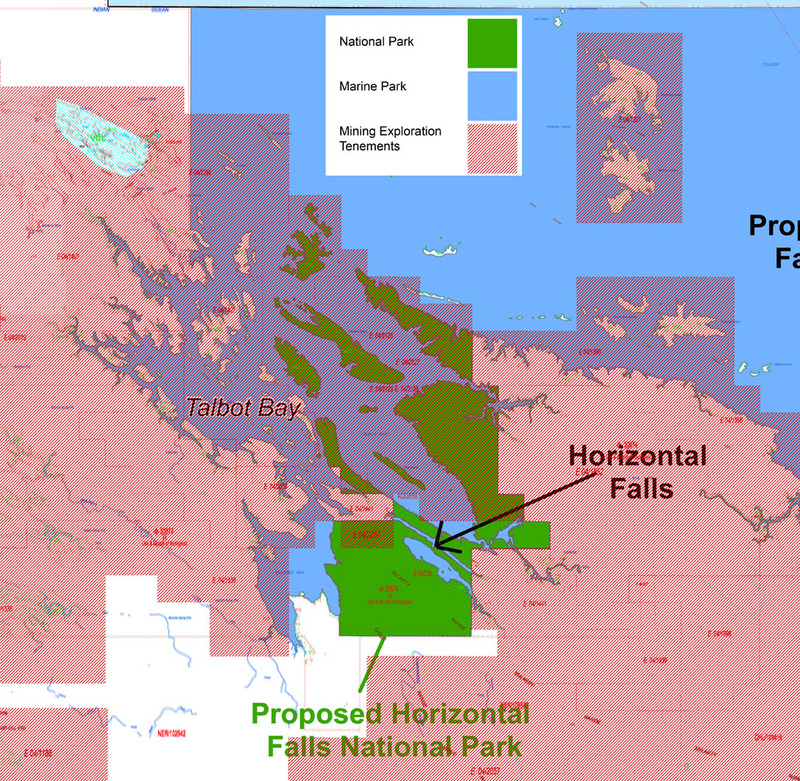 In 2011, following a proposal by Pegasus Metals to drill immediately adjacent to the falls, conservationists and tour-operators launched a joint campaign against copper prospecting near and around the site. Robin and The Greens (WA) led a petition the following year and the WA government banned mining and exploration within a 72km2 area around the falls in honour of the site’s significance (area shown below). This ban, reviewed biennially, saw several companies withdraw proposed projects and applications to explore. In 2013, the former state government also established a 160km2 national park and a 3,000km2 marine park in the area; awarding them ‘Class A Status’ to protect from further development. Barnett’s exclusion zone ceased several tenements but this was not the anticipated coup-de-grace to the mining industry in the area. 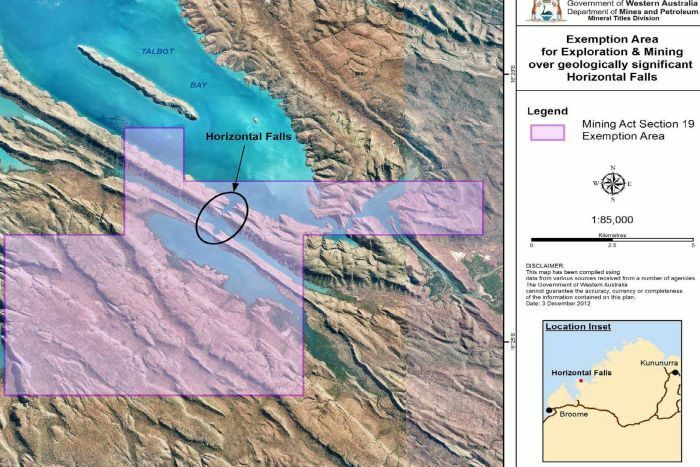 The figure below shows a 2013 update for a marine and land national park around Horizontal Falls; around fifty percent of protected land, and thirty percent of protected waters, are situated in exploration tenements. Robin, along with the Greens (WA), called upon the WA government to revoke all exploration tenements in the new national park. However, May 2014 saw the amendment of the Mining Act (1978); creating an “exemption clause” by way of Section 19. Under the exemption, no mining tenure can be applied in the Horizontal Falls region unless expressly stated by a government minister. Albert Jacobs - Environment Minister in 2016 - extended the protection of the Horizontal Falls land until November 2018. The same year, the Lalang-garram/Horizontal Falls Marine Park was created under the Kimberley Science & Conservation Strategy; jointly managed by the Dambimangari Traditional Owners and the Department of Parks & Wildlife. However, in August 2017 a tourist plane discovered a bulldozer clearing bushland to make a road to a new Rio Tinto exploration camp, just some 15km south of the Falls. This comes after the statement, two years prior, from Former Rio Tinto Company Chief Sam Walsh, that the Mitchell plateau was too sensitive to mine. Environs Kimberley executive director Martin Pritchard said "The Horizontal Falls experience brings in tens of millions of dollars to the Broome nature tourism economy and a copper mine is a real threat to the Kimberley tourism brand," and later warned “the McGowan Government needs to make a serious policy decision to ensure this part of the Kimberley coast is protected from industrialisation” or risk losing the Kimberley’s tourism and associated revenue. Department of Mines, Industry Regulation and Safety environment executive director Karen Caple remains confident that resource exploration and Kimberley tourism can coexist, maintaining that “an approved exploration activity is being undertaken, involving track clearing, camp site and geophysical evaluation… [the approval] includes a number of environmental management and rehabilitation commitments.". The Greens (WA) are committed to protecting our unique environments and natural habitats. Our most important natural and cultural heritage ought to be protected from any large-scale disturbances, such as mining. The Greens (WA) also aim to remove environmental regulation from the tenement-based Mining Act 1978 (WA). Defend Horizontal Falls from Robin Chapple on Vimeo.